Latest Update 19th June 2005. 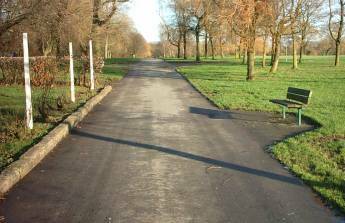 A new path has been completed at the Abbey Hey end of the loop. This was the missing link, where the path stopped. The path has been added along with general landscaping of the area. Click here for the Updated pictures. This follows on from the first part of the Fallowfield Loop page. On a cold but Sunny December day I decided to take a walk down to the other end of the Loop.  I had got a puncture on my bike the previous week, and am awaiting a new tyre and tube. I am looking forward to riding this route - however in places it was heavy going, so if you are on a mountain bike prepare for some mud splashes. 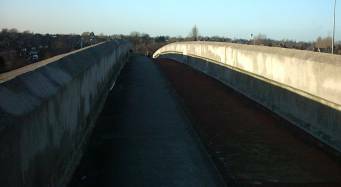 The approach to the Hyde Road / M60 bridge. Cyclists are well catered for. There is a specific bike and pedestrian route from just after this sign post, right through to Hyde Road. 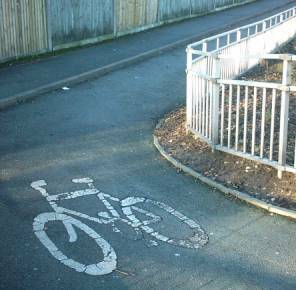 This is a safe and easy way to get over a very busy roundabout. Not the best shot - but this was taken on the bridge. To the right hand side is the bike path, to the left the raised pedestrian path. On the other side of the bridge the path weaves back down to Hyde road. Hyde road is busy but wide. So you can safely ride tight on the left. However you have to watch out for traffic pulling out. 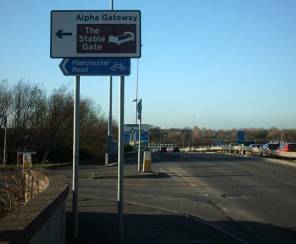 I went this way towards Debdale Park / Gorton / Abbey Hey. 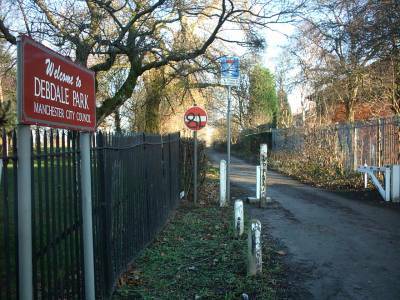 The entrance to Debdale park from Hyde road. The path running next to it is Debdale Lane, a dirt path that eventually runs through the golf course to Audenshaw Road. I took the path through the park. Walking through Debdale park. This park (like many others) was once a grand and colourful place. There was a big play area, pitch and put, petting area, bird cages, sailing boats, bowling greens etc. I used to spend time here as a young boy - and even in the early 80s a lot of the above activities were still available. My Grandad used to work here as a park keeper - maybe that's what our parks are missing. The park is nothing like it used to be - shame really. There were a few parents out with kids, but it was spoiled by a young lad on a very loud motorbike, racing up and down the path. Not very safe, especially if you have kids or are walking a dog. Greenfold path running through the park. 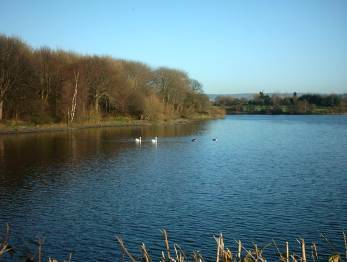 This path splits the Gorton reservoirs. The path is a little heavy - but passable on foot and by bike. Gorton Upper Reservoir - This doesn't look a picture taken in he middle of a urban sprawl. Just shows they are some nice views on our doorstep. This area has been under risk - over the last 10 years or so, developers and the council have been in discussions about development of this area. The last plan was blocked after a lot of campaigning from local residents. I hope this land stays protected. So much of our urban green sites have been developed with yet more offices and standard fast food / cinema outlets. Lets leave this land to nature. The bike path starts again at this point. I don't know why there is a missing piece. The path does divert via Debdale park, but I don't know why they didn't continue the route down to Hyde Rd - where the path starts. Updated - Click here for the latest update - the missing piece of path has now been built. 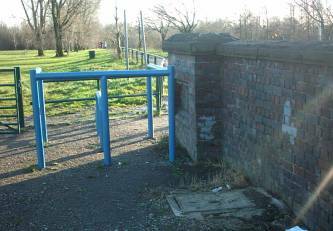 As you can see gates have been fitted to allow walkers and bikers through. The old bridge is to the right. The line has been completely filled in at this point. I remember this when it was the old cutting, and it was deep. So I understand the safety side of this. It doesn't look like this part of the line will ever be used, in fact both spurs at this end have been filled in. Making it very very difficult for this part to be re opened. The new path looking towards Falmer close and Wright Robinson School (on the right). 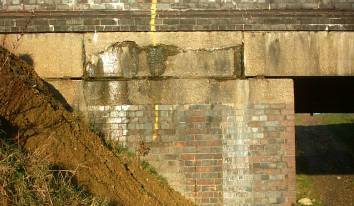 There is no trace of the railway - the cutting has been filled completely. Falmer Close - The bridge is still here - I thought they might have demolished the sides. It looks a bit weird filled in. Falmer Close - looking towards the school/ No trace of the line what's so ever - but the path is well looked after and easily passable on bike or foot. So well done for preserving the route for others. Note the gates - in blue. Towards Fairfield station. The path continues and is of good quality. 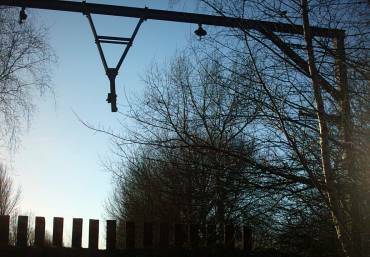 It stops just before the old catenary, and it bears to the right - back round the upper reservoir and back to Debdale Park. 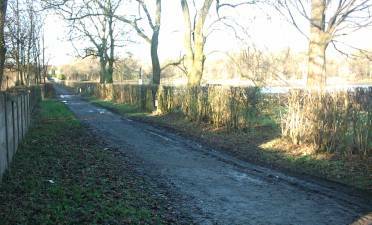 I noticed some signs from the council announcing a path change, but the news is good as it involves the improvement of the path around the reservoir (which can be muddy) - that's good news. 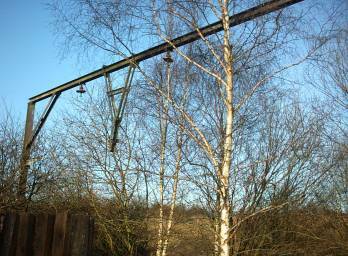 Just before the path bears off the loop, there is one of the original catenary loops still standing. This just appears from nowhere as a reminder of what this line was all about - a modern electric mainline! Close up - I don't know why this was left, but its nice to see a reminder of the lines past. Looking back to the main path, you get an impression of how much of the original cut has been filled in. I am standing on the original line. The row of sleepers indicate the end of the path and how high it is. Glad they re-cycled the old sleepers. 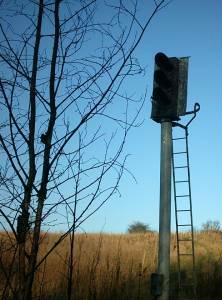 This signal is on the approach to the junction at Fairfield station, where the line joined the Woodhead route. This is last and only signal on the route. I am amazed it has been left and not torn down. I took these pictures from the original line. The path is unofficial and not paved at this stage, but its passable (if not a little muddy). There is a lot to look at, from an industrial heritage side anyway. A stump that was left when they took the catenary away - it looks like it was chopped through very quickly and taken away for scrap. The approach to Fairfield station - the station is under the bridge to the left hand side. There was a platform here, but I don't know how many trains actually stopped here. The original catenary still exsists. 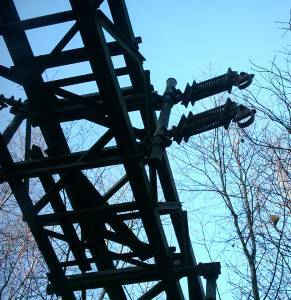 A close up of the catenary - a lot of the actual workings still exsist. These look like 2 big springs that maybe were attached to the electric line. 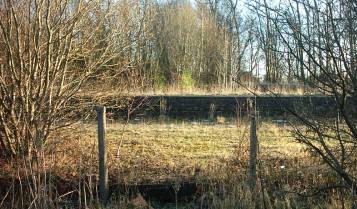 To the right of the approach to Fairfield station - It looks like an old goods yard. 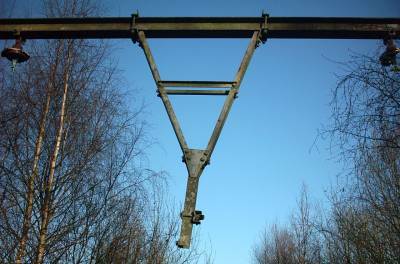 The structure in the picture looks like an old loading platform. The area is very derelict, with no real signs of its past history. Maybe somebody could shed some light on this for me. The location is just off Booth Road in Fairfield. The line split in 2 at this point, it is hard to imagine as the cutting has been filled in. To the right the line led to Fairfield station and off towards Glossop then Sheffield on the Woodhead route. To the left the lane ran through Abbey Hey and back towards Gorton and Manchester. This was a handy spur as trains from either direction could easily use the loop. This was also a factor in why they built the Reddish Depot on the Loop. 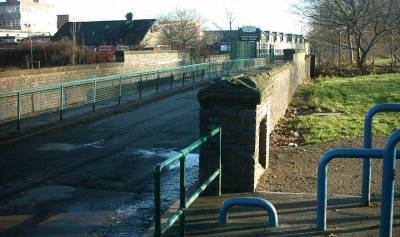 Abbey Hey Lane - This is what is left of the bridge - the line has been filled and landscaped. The line then headed to the left - and back towards Manchester. Again the cutting has been filled and a path built on it. Behind me, a kids playground has been built and some nice landscaping has been undertaken. Its nice to see a good use has been made of the line. To the right of this picture is Vine Street. The path above leads to the allotments that back on to Debdale Park. At this point the line split. The bridge was double size. 2 lines on each side. Only one now survives. The left hand side one has been filled. A close up of the bridge - You can see the support for the other one just behind the rubble and mud. Maybe the crude yellow mark is the middle of the bridge. A long shot of the whole bridge - you get a feeling for the width of it. I don't know why they left just one side. I do know that trucks carrying rubble used the right hand side to get through to Abbey Hey. The path could easily be added to this part of the route. This part of the route is passable, but its very muddy and hard going. 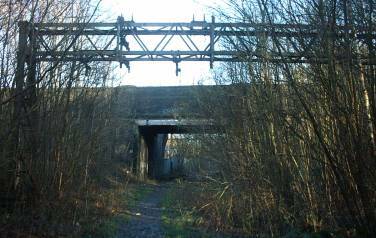 Well that concludes the 2nd part of the Fallowfield Loop - Its a shame that the line, in this area, doesn't really exsist anymore. 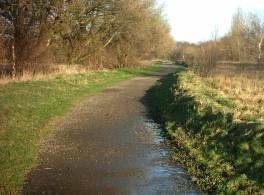 However its great to see the route being used as a high quality footpath / cycle route that we can all use. 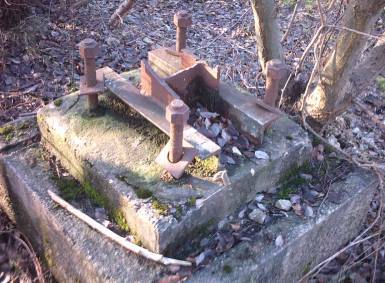 Its also an interesting part to look at some industrial heritage (if like me - that's your thing). Latest Update 19th June 2005. Missing link path has been built. If you have been following the News page you will have seen the updates about the loop near Debdale Park. The loop was closed from Station Rd down to Debdale park. This was for landscaping work behind Debdale park. It wasn't made clear what was going in in this area, but I hoped the path would be added, which it has. I took regular trips down to check the progress of the works. Here are the latest pictures. 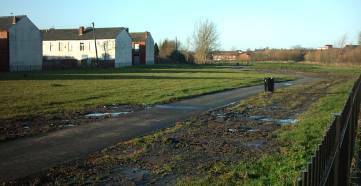 The missing link - Between Debdale Park and Greenfold / Abbey Hey Lane. Taken with my back to the old bridge which carries Alston rd (dirt path) to the Debdale allotments. I am looking towards Fairfield station. The line has long been filled in, but you can see the recent addition of the path. 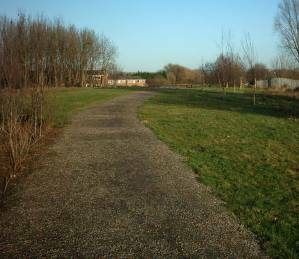 The path splits to the left, that's towards Abbey Hey lane. While straight on takes you to Fairfield station (past Wright Robinson school). This is looking back at the bridge (Alston St). You can see that the bridge has been completely filled in. Here the bridge was double in size as the line split into 2. Just one of the arches was open, but now its been filled in. I can only think this has been put in place to make it easy to access, for safety and because Altson St (at this point is quiet). Before: This was taken early 2005, one of the two arches survived. After: Both are now filled in. You can see the path will go round the bridge instead of under it. A close look where the path splits. To the left towards Abbey Hey lane. Straight on to Fairfield Station. Looking towards Abbey Hey lane. The whole area has been totally landscaped and the path added. Further on down the path towards Abbey Hey Lane. Back towards Fairfield station - Green Fold is ahead. You can just see the top of the railway bridge. 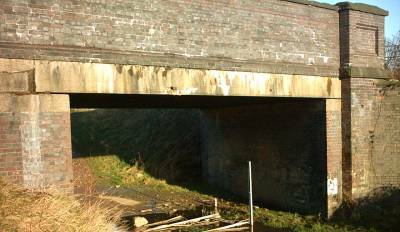 Another shot looking back at the bridge that took Alston St over the railway. The bridge is now completely filled in. The view towards Hyde road. This is the start of the new path, Ahead is the original start place of the loop. (over the old Stockport Branch canal). I am really pleased they have completed this extra path. It now makes the loop longer and gives it better access to Abbey Hey. I would like to take another look at this area soon to get some updated pictures of the finished route. They were still finishing off the path and landscaping when I took the last set of pictures. This extra path opens up the route further and it also tidies up a once waste land area. Take a look next time you are on the Fallowfield Loop.